In the past few days, I came across this painting by Augustus Tack. I haven't been drawing or painting at all and am reminded of what is missing in my life. I remember seeing this painting years ago (maybe in in a book when I was back in college in the the 1980s, maybe when I was in Washington, D.C. in 1982) and wishing I had painted it. For the last few months, I've been working on a poem about my childhood experience of being astonished by hearingMahalia Jackson sing on the television sometime between 1954 and 1957, and an image that came to me recently of the emptiness held in the Buddha's hands as he sits in meditation, as well as the concept of Ayin, the "experience of nothingness" (Rabbi Tirzah Firestone). I haven't written anything down, but the images and experiences continue to speak to me. lovely contemplations, am. 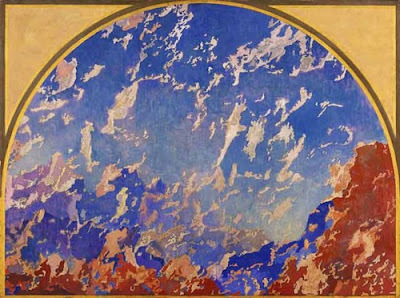 And quite in line with the painting: I love how I see it: mountain and sky fragmenting and turning into one...the things we call 'solid' shifting into nothingness. It's a fabulous image. Your task of writing is huge...these are big concepts that are so elusive. Best wishes in capturing the essence of what you want to say! Welcome back to the land of the living, am. Glad to hear you want to start painting again. Thank you for the encouragement, Taradharma and Loren! is now up and kicking in an apartment which leaves room for one bed and a yoga mat! Lost your email and phone number but wanted to share a new gallery opening First Friday that may be interested in carrying your work and books...they are carrying mine. I am struck by the connection of the things that are inspiring you, how they resonate together in you. Mahalia Jackson's presence and Buddha's empty hand, a painting where the clouds turn into birds and Ayin. Beautiful. Thank you, Yum-Yum and robin andrea!